Picture Bible Code: Hurricane Rita. Hurricane "Rita" means, "A Pearl"
"(The hurricane) concerns my justice, O' my people. O' Sea, (behold) the eye of Rita!" Today, Sept. 20, 2005, I remembered that the Hurricane Jeannie bible code put on the net one year ago also referred to a "pearl." Unfortunately, because I leaned to my own understanding at the time I did not choose this possible reading for the second large blue circle (representing Hurricane Jeannie). The second large blue circle/wheel (or, hurricane) declares: "It concerns my justice, O' my people. O' Sea, a weak eye (or, fountain)! But it can also read: "It concerns my justice, O' my people. O' Sea, the eye of a pearl!" O' Sea, (behold), the eye of (hurricane) Rita!" The numeric is very important since the 6th hurricane that the Lord spoke to me about from the code was Hurricane Emily. The Emily bible code forms an image of a rod (or staff) beside a storm-cloud (or Rock). 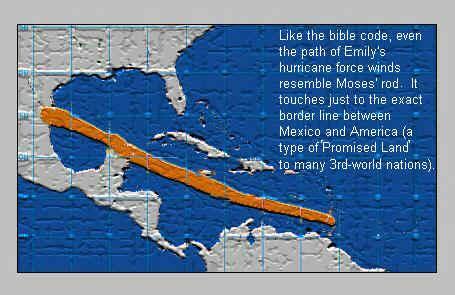 Remarkably, the actual path of hurricane Emily also formed an image of a rod as it passed across the ocean and the Gulf of Mexico! I have said that Katrina is the judgment that Ivan and Dennis set out to do, and so likewise perhaps Rita is the judgment that Jeannie was to perform --- I'm not sure. I am speculating here. But for some reason the words of this code say one thing for Jeannie but something slightly different for Rita--- and there must be a reason why. Amazingly, the Emily bible code has the "rod" of "Emily" striking the very eye of Hurricane Jeannie/Rita (when forwarded 1290 + 1335 letters) so that the "cloud" of the Emily bible code also overlaps the upper balance hand, which in turn represents hurricane Katrina! And at 1290 + 1260 letters it also strikes the eye/center of the top right hurricane/wheel too! This is because the two set of wheels are 75 letters apart. Numeric of wheels is awesome! 1290 + 1260 + 75 = 1290 + 1335 letters. See Dan. 12; Rev. 11-12 --- where both the context and the numeric agree. The center of all four wheels is up 1260 + 1335 letters from the rod of Emily, which is the same number of years from this vision by Ezekiel! It lands on the text encoded in the image that reads, "A balance I am!" Astoundingly, 1290 + 1290 letters lands at the exact center of the river and menorah lights, which reads "I AM Jesus!" --- landing on the first letter in the name Jesus!" See other documents for what the entire river says. 1290 + 1290 is also 430 x 6 letters, also agreeing with the 430 days Ezekiel laid on his side to bear the sins of the house of Israel. More on the numeric of the wheels as seen in the image at above right: The text is arrayed at 11 letters. The upper two intersecting wheels are 75 letters apart from the lower two intersecting wheels. Each wheel (hurricane) is 90 letters long by itself. (ELS 15 x 6 = 90 letters.) This number symbolizes three months of time (3 x 30 = 90 days). Therefore, the sum of all four wheels total 360 days, which is also the number of degrees in a circle/wheel! How do I know that the upper wheels are meant to be there? Only the lower wheels have a reading. The upper wheels are meant to be there too, as deduced mathematically, but I have not found anything there that reads intelligibly. However, a year ago the name "Kati" (or "Kathy") was found. It reads in a circle in the upper balance hand in a location in exact juxtaposition to the lower hand where the eye of Ivan is located. I noticed this last year and spoke of it to others, though I did not know that it represented the then still future Hurricane Katrina. "The Jabok (river) will be poured out (or made desolate) by means of (hurricane) Kati (Kathy)." (This occurs one other spot along the main river as well, except there we find the name Jesus instead, [or, "There is a fountain"]. Importantly, it is found again in correct juxtaposition to the name Jacob. [See the above right image.] That is, both flow out from the fountain/eye of the dark green wheels/hurricanes into the main river. Note that the Hebrew word for eye can also mean fountain. This is more than remarkable! It's awesome! Also notice the "cloud" overtop the upper balance handle in the image at right. It represents the storm-cloud of both Emily and Katrina. (See the Emily document for further explanation. The Emily cloud is forwarded 1290 + 1335 letters.) The cloud and the "Kati" circle and the numeric together prove that the two upper wheels are indeed there even though no circular code exists for them as there does for the lower two wheels. However, this is not to say that there is no code present for all four wheels when viewed as one unit! The eye or center of each wheel lands upon the text of Isaiah 46:3-4, and this reveals to us the meaning of the four wheels! "O' house of Jacob! And O' house of Israel! I have made you and I will carry you (in my chariot over the river of Judgment)!" I know that linking the names Kati to Katrina appears to be stretching it some what, but I can only say that the Lord has shown me that this is so by certain signs that I am not at this time at liberty to reveal. Also, as said, I noticed the 'Kati code' and discussed it with others an entire year before hurricane Katrina. Besides, both names are variants of each other anyway. Kati (Katrina) means "pure one," and here we have a picture. We have a portrait of Jacob (another name of 'Israel') being borne up above the river of judgment at the Jabok/Jacob river in God's chariot ---the Lord Jesus Christ. It is there that he/she has their name changed to Israel/Katrina and is made pure in the life giving waters! 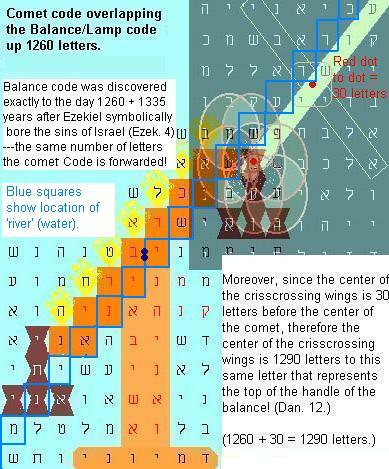 Recall that the code was found to-the-day 1260 + 1335 years after Ezekiel likewise symbolically bore up the sins of Jacob (Israel) upon himself --- a type of Christ on the cross, (Ezek. 4). However, negatively, on earth Katrina brought the very opposite to this world. She brought death in a waste of polluted waters --- the opposite of pure life-giving waters. "For unless you repent you shall all likewise perish," Jesus said. This message of Jesus coming in (or as) a fiery flying chariot (symbolically speaking of course) also agrees with its companion picture bible code discovered just after Hurricane Jeannie of last year. 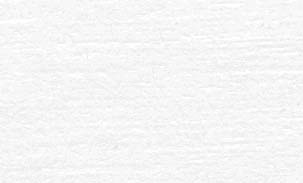 In the below bible code Jesus is also 'flying' as symbolized in the roaring cherub picture code. (Interestingly, the chariot of God in Ezekiel's vision was drawn by four cherubs, one of which "had the face of a lion", [Ezek. 1:10].) As a matter of fact, both images contain cherubs; and both codes judge NASA and Lucifer, the fallen cherub. All eight names of the hurricanes (of the code) when put together proclaim an important prophecy!